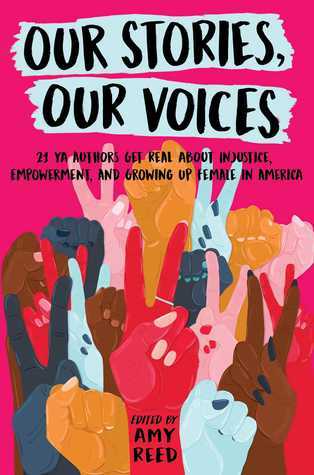 SYNOPSIS:From Amy Reed, Ellen Hopkins, Amber Smith, Sandhya Menon, and more of your favorite YA authors comes an anthology of essays that explore the diverse experiences of injustice, empowerment, and growing up female in America. This collection of twenty-one essays from major YA authors—including award-winning and bestselling writers—touches on a powerful range of topics related to growing up female in today’s America, and the intersection with race, religion, and ethnicity. Sure to inspire hope and solidarity to anyone who reads it, Our Stories, Our Voices belongs on every young woman’s shelf. This anthology is a tough one for me to rate. If I were reviewing it based solely on the nature of the work—this book about intersectional feminism, equality and equity, and fighting back against a society that perpetuates things like treating women and nonbinary people as less than men (and women/nonbinary people from marginalized communities as lesser, still)—it would be a 5-star read, with no hesitation. We are living in a cultural battleground where, for many of us, our very identities seem to be under attack. Unfortunately, the execution of the collection leaves a bit to be desired, and if I were rating it exclusively on my enjoyment, it would be 3-star worthy (hence my compromise at 4 stars in the end). One of the problems that I found was that, frankly, the collection feels repetitive by the end of it. If I’d read one essay a day, maybe this wouldn’t have been an issue, but as it stands, I read this in two days, and was feeling by the end as though I was rereading earlier pieces. These boys and men are ghosts. None of them have edges. They bleed into one another. They are the same. My enjoyment for the collection as a whole dropped in the final third, where we had one story in particular from an author who has already proven herself not to be an intersectional ally of people of color, yet spent far too many pages explaining her privileged upbringing and humble-bragging about what a great activist she considers herself to be. It felt like a bold, unintentional reminder of why allocishet white women need to stop being what this society accepts as “the face of feminism”. He was always blond. Except, somehow, when He was on the cross. Only in the moment of His deepest suffering did artists consider He might have walked this earth as a dark-haired, brown-skinned man. Of course, there were some real gems in the collection, like Anna-Marie McLemore’s; I always love the way she has with words, and her descriptions of how difficult it was to grow up religious in a world where her deity was whitewashed by the masses was incredibly insightful to me, as a white former Christian who never had to deal with those devastating thoughts as a child. I was also particularly fond of Sandhya Menon’s bit on immigrating from India, Julie Murphy’s story that managed to weave fat rep and recognizing that her privileges as a white woman still protected her despite her size, and Amy Reed’s devastating recounting of sexual assault. All in all, while this was certainly not the best nonfiction anthology I’ve read, it’s still definitely worth a read (though you can probably skip Ellen Hopkins’ story with no harm done, to be fair). Especially if you are a person who sits in a great place of privilege, the greatest thing about this collection—and the reason I am still giving it 4 stars—is that I do think it has a great deal to offer in the ways of encouraging intersectionality, which is something we can never have too much of. One of my bosses has a story featured in here! Yep, she’s in there! That’s so cool!